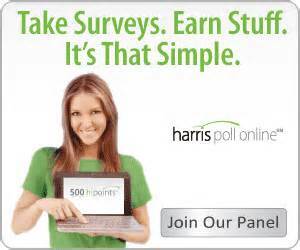 Harris Poll (Surveys) | Extrapolate This! I’m not a big fan of most of the survey places you find online these days. They’re too much work for what amounts to little payoff, but I do like being rewarded for providing my input and doing some everyday things. I’m still a fan of Swagbucks even though I’ve been slacking lately on their surveys and videos you complete/watch for credit. And when it comes to physically going to the store and being rewarded, Shopkick is another great way to be rewarded. I joined Harris back in the beginning of April of this year. So far I’ve accumulated about 4400 points. This is more than enough for a $25 gift card, and about 1000 points towards the additional 3000 points I need for a $50 card. I know, it’s not earth shattering money. But for what amounts to about 10 or 15 minutes every other day or so, it all adds up. We use this as “blow” money so to speak by redeeming the points for restaurant gift cards. We don’t actually incur this expense of eating out, so it’s like a nice bonus since we’ve pulled back on our unnecessary spending with me being out of work. I’m pretty confident I could have been at the $50 gift card in three months. To me this is a nice deal. We can typically eat out at one of the places offered twice with a $50 card further taking advantage of the “freebie”. Additionally, when we combine this gift card with the others we receive from our Discover rewards and Swagbucks, we’re pretty much able to eat out a couple times a month without having to actually use money needed for other things. And if you don’t want to spend Harris points (they call them HI points) on restaurant gift cards, there are plenty of other items they offer as rewards. Check out the list!